In June I have been going thru the individual factors in my experience chart from the 2018 magazine. For a complete breakdown of each of the factors involved you can read those individual blogs. I conclude the series by combining the five factors into my final ranking. I then devised a formula that factors all 5 into the total points equation and then turned the point total into a number from 100 to 0. A (100) would be a team with 25 seniors (NCAA scholarship limit) in the two deep and every yard and tackle returning and 120+ career starts on the offensive line. A (0) would be a team with no experience and 0 seniors in the two deep. 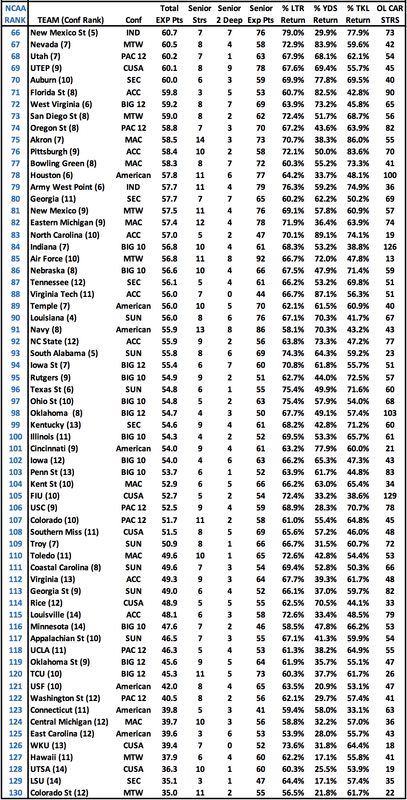 Just as in years past the first number is where each team ranks in the NCAA. At the top of the chart this year is Kansas as they have 19 returning starters and just 14 lettermen lost from last year and ranked high in every category. Georgia Southern #2 with 18 returning starters this year and just 10 lettermen lost. 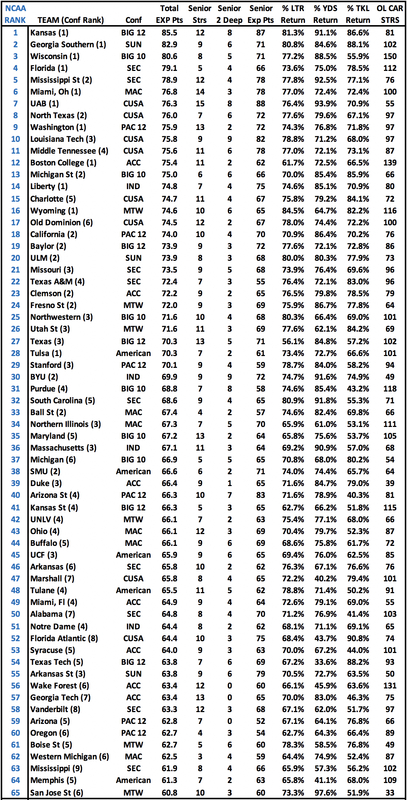 At the bottom of the list is Colorado St #130 with 9 returning starters and 30 letterman lost. The rest of the of the bottom 10 are #129 LSU (#95 LY), #128 UTSA (#2 LY), #127 Hawaii (#51 LY), #126 WKU (#80 LY), #125 East Carolina (#98 LY), #124 Central Michigan (#55 LY), #123 Connecticut (#40 LY), #122 Washington St (#16 LY) and #121 USF (#36 LY).